Worries about declining numbers of the Monarch Butterfly (Danaus plexippus) regularly appear in the press and on wildlife websites. Yet this isn't a new problem. In 1992, the University of Kansas began its education and research program Monarch Watch to help track changes in Monarch population and migration. High Country News reported in 2013 that Monarch Watch volunteers had tagged 1 million of the butterflies since the 1990s and received tracking information on 17,000 of those tagged. A 2011 San Francisco Chronicle story reprinted at the Xerces Society website notes that although the West Coast Monarch population experienced a major increase that year, the upswing occurred following a 90 percent decline from 1997 to 2010. The western migration is once again in trouble, along with the eastern migration. Similar to the eastern Monarch journey, one problem in the West is habitat loss due to development and changes in agricultural uses of herbicides that eliminate milkweeds. A second problem that High Country cites is drought and greater summer heat along the West Coast. Illegal logging northwest of Mexico City where Monarchs overwinter in Oyamel Fir (Abies religiosa) forests, has caused their winter habitat to shrink from 50 acres to less than three. Drought and warmer-than-normal temperatures in spring 2012 caused Monarchs to arrive earlier and nest further north than usual, which disrupted their breeding cycle. Monarch eggs dried in the heat, which also decreased plant nectar. This caused the butterflies to lay fewer eggs. Wild milkweeds in agricultural feeds are becoming scarce due to use of herbicide-tolerant crop seed, such as genetically modified corn and soy. Unfortunately, Monarch caterpillars feed only on milkweeds. Millions of acres of grasslands and nature reserves, which once contained milkweeds, now are used for agriculture. Conditions in the oyamel forests are similar to those along California's central coast. In both locations, moderate winter temperatures and light humidity keep the butterflies from burning too much body fat and drying out. Butterflies winter over in many ways. Some crawl into dry piles of brush for a long sleep; others cling to bushes and trees in their cocoons. But Monarchs huddle together on tree branches by tens of thousands, according to the U.S. Forest Service. Although a single Monarch weighs about 1 gram, colonies can be so heavy that tree limbs break. Obviously a shortage of forest means more crowded branches -- another peril for Monarchs. An October 2013 editorial in The New York Times notes the dilemma faced by Midwesterners who have spent decades trying to clear milkweed from fields and roadsides. Now counties and other local governments are trying to reverse the Monarch migration problem by replanting what may no longer be considered an invasive weed. Monarch Watch encourages businesses, home gardeners, park districts, schools and zoos to offset the loss of milkweeds by planting Monarch Waystations containing milkweeds and nectar species, including Salvias. For those gardeners who would like to plant well-developed sets instead of seed, please see the butterfly garden plants from Flowers by the Sea. Although Monarchs are not yet listed as endangered species under the U.S. Endangered Species Act, the Europe-based International Union for Conservation of Nature has listed Monarch migration as a threatened phenomenon. To learn what you can do to aid Monarchs in your own yard, please feel free to contact us. We also hope you will read on to gain a better understanding of Monarchs, which are among the greatest athletes on Earth. Bear with us as we take you on an imaginary journey: You get on a jet at Mexico City for a round trip journey to Toronto, Canada, but you never get back to Mexico. You stop for a layover in Colorado and don't get on another flight. Instead, you settle down, get married and have babies. The babies grow up and you die. Now adults, your children get on another jet and travel from Colorado toward Canada. They get off in Nebraska for a layover, and experience the same life pattern as yours. Next, the third generation resumes the journey to Ontario and, if lucky, arrives. However, if your grandchildren stop short of their goal, a fourth generation of great grandchildren will continue on to Toronto and die there after raising a family. Then, depending on how many generations it takes to reach Canada, your great grandchildren or great-great grandchildren -- more strong-willed than all the other generations -- will make the long return journey from Toronto to Mexico. Eventually, their children will begin a new trek to Canada. Now that your fictional journey is over, here is a summary of actual Monarch migration. 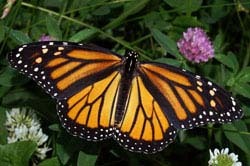 In springtime, east of the Rocky Mountains, Monarchs migrate north and east from Mexico to southern Canada. West of the Rockies, they migrate northward from various points in central to southern California to the foothills of the Sierra Nevada Mountains bordering California and Nevada. National Geographic provides a helpful description of the differences between the eastern and western migrations. Whether east or west of the Rockies, it takes three to four generations of Monarchs to arrive far north and a fourth or fifth generation to make the journey home. For Monarchs on the eastern migration route, the return journey to Mexico is roughly 3,000 miles. This round-trip of generations takes place over a year's time along both migratory routes. During all parts of the journey, Monarchs need lots of nectar-rich plants, such as sages (Salvia spp.) to fuel their flight. When settling down to bear the next generation, they need milkweeds (Asclepias spp.) as host plants, because milkweeds are the only plants on which Monarchs lay their eggs. Unfortunately, changes in climate and agricultural practices are depleting the number of milkweeds growing wild. So many home gardeners are adding the plants to their landscapes. Due to research by Monarch Watch and other wildlife organizations as well as tracking efforts by the Mexican government, we now know about the dramatic ups and downs of the species and have a clearer picture of how its migration is endangered. Monarchs journey along two known routes: one looping along the California coast from the south to the mountainous northeast boundary with Nevada and another making a circuit between forests northwest of Mexico City and Ontario, Canada. You can aid the miracle of migration by Monarchs and other butterflies by planting butterfly gardens containing both nectar and host plants. Red Neck Girl Forsythia Sage (Salvia madrensis 'Red Neck Girl'). At Flowers by the Sea, we grow a wide range of butterfly favorites. Some are available year round and others at specific times of year. When a plant is unavailable, you may request placement on an email list to receive notice when it is in stock. Just look for the "Notify Me" button at the end of the plant description. Access to a queue of butterfly plant descriptions is available via our Butterfly Plants Category in the green Plant Categories Index on every page of our website. The list also includes Salvia companions such as various types of Agastache and Milkweed. You may also find it useful to read a comprehensive article about developing butterfly habitat in our Everything Salvias Blog. At FBTS, we appreciate butterflies for their beauty and their role as garden pollinators. Feel free to contact us via phone or email to discuss butterfly gardening. We're glad to provide plant suggestions and promote the survival of these hard-working garden helpers.